While Gerri met with some Hall of Fame staff members to coordinate travel arrangements for the upcoming enshrinement celebration in August, Joe strolled through the exhibit areas at the Hall. 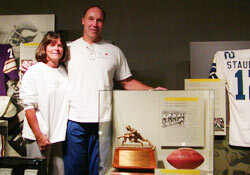 Joe and Gerri DeLamielleure pose next to a trophy honoring the 1973 Buffalo Bills offensive line. The ball was from the last play by the Bills in the game that O.J. Simpson became the first player to rush for 2,000 yards. At one point, he invited a pair of youngsters to join him for a picture by a display honoring the Buffalo Bills' offensive line who won the Outstanding Blocker Award in 1973. DeLamielleure anchored the Buffalo front line - nicknamed "The Electric Company" - that paved the way for O.J. Simpson when he became the game's first 2,000-yard rusher. "Joe D" will take his rightful place among the game's all-time elite when he is formally enshrined during a nationally televised ceremony on Sunday August 3. "It's overwhelming and humbling," he stated in reference to his election to the Hall in January. "And then when you really come here to the Hall of Fame and see these things, it's even more overwhelming." Joe and his entire family have been ecstatic ever since they learned of his election to the Hall of Fame on the day before Super Bowl XXXVII. "Well, it's the realization of a dream come true," commented Gerri. "We pinch ourselves every day that this is actually happening. I wish I could think of words to describe it."